Westgate Resorts contracted RP Visual Solutions (RPV) and Christie to build the world’s largest LED Video wall inside the Westgate Superbook at the Westgate Las Vegas Resort & Casino. Working with HB Communications, RPV and Christie created an enormous curved array measuring 20 feet tall and 220 feet wide and comprising 1,640 2.5mm Christie Velvet LED tiles boasting over 65 million pixels. 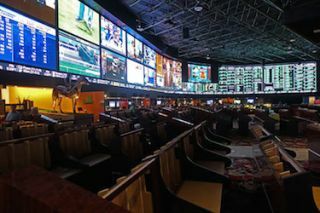 This enormous video wall spans the length of the world’s largest sports book, creating a stadium-like experience where every seat in the newly renovated Westgate Superbook is a “front-row” experience. Along with the construction of this screen, the Westgate Superbook was completely transformed to create a stadium-like experience, including over 300 relaxation lounger chairs and a 100-foot long curved bar that conforms to the shape of the screen. Suitable for 24/7 operation and delivering high-resolution, bright, and seamless visuals with wide viewing angles, Christie Velvet LED tiles can be configured into any size or shape for unmatched creative freedom.